This Java program for Multiplication table allows the user to enter any integer value, and prints the multiplication table from that number to 9 using For Loop. Condition is True. So, Statement inside the system.out.println will be printed. Second For Loop will repeat the process until j reaches to 11. Because, if j is 11, condition will fails so, it will exit from the second loop. 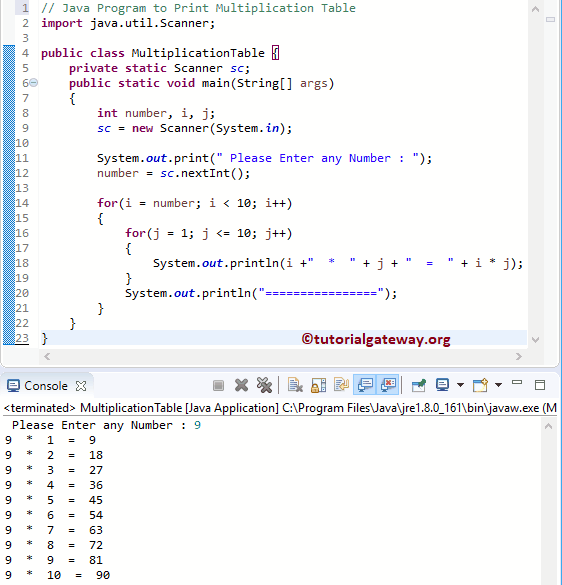 This program for Multiplication table in Java is same as above example but this time we are using the While Loop.